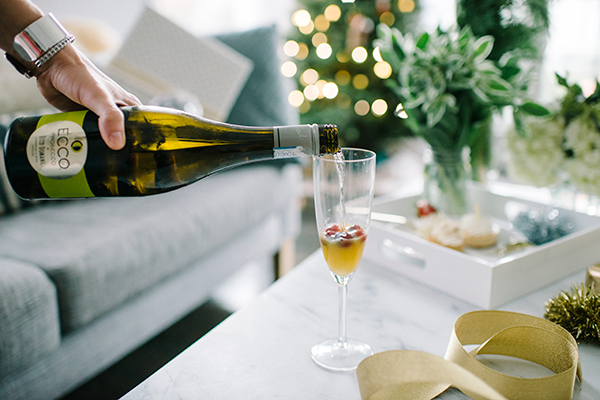 The holiday season is always an excuse for me to surround myself with the people I love, shower them with presents, and of course enjoy festive cocktails. I finally got my Christmas tree so I am really getting into the holiday spirit over here. To celebrate, I’m so excited to partner with Ecco Domani this season. I love that they inspire me to add a special touch to upgrade my every day. This time, it’s all about gift wrap! I wanted to share my spin on a Holiday Wrapping Happy Hour,not just your average gift wrapping session. Usually I’m sitting in my office wrapping gifts for family and friends by myself. What’s the fun in that?! 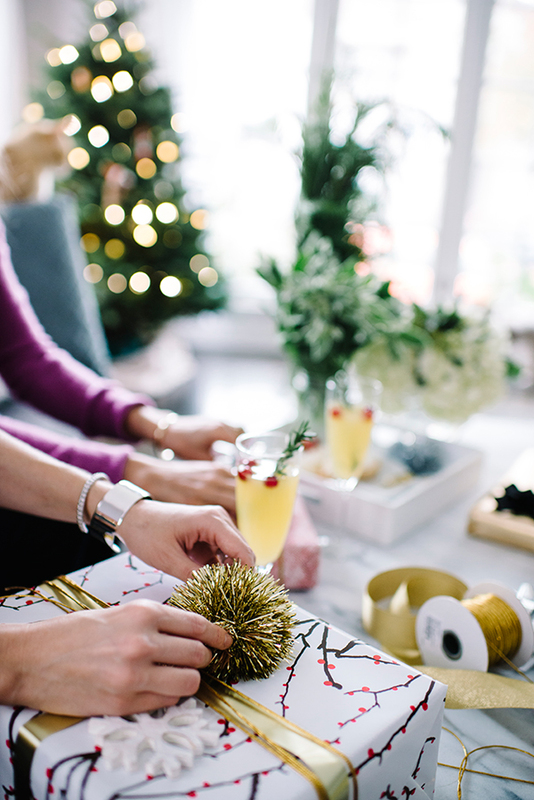 Invite your friends over for a wrapping party and some cocktails. The Cocktail // When I think festive, I think fizzy. So naturally that means it’s time to pop the prosecco! Ecco Domani recently launched the newest addition to their collection, their Ecco Domani Prosecco. I am ALWAYS on the hunt for new prosecco to stock my fridge so I was excited to try it out. For a daytime cocktail, nothing beats a classic mimosa. So I call this drink my Mimosa with a Holiday Twist. Place 3-4 fresh cranberries in the bottom of your champagne flute. Pour a splash of orange juice into your flute. Next, open your prosecco bottle and top off your glass. Finally, garnish with a fresh sprig of rosemary for a great spicy twist. This drink is so light and refreshing and is the perfect midday treat with my girlfriends. The Treats // Nothing pairs better with prosecco than some sweet treats. I picked up some mini cheesecakes for my friends to enjoy. All these elements create the perfect wrapping party that you can throw with your friends. Stay tuned for another holiday post with Ecco Domani next week! Big thank you for supporting all eat.sleep.wear. collabs! Peppermint Dolly - What a brilliant idea!! Accidental Icon - What a fun idea! Am going to have some wine delivered and call up some friends. Fashion Snag - Cute post! Lindsey - This is such a cute idea! And the quality of your photos is amazing! Natali - So many beautifully wrapped presents! Can’t wait for Christmas! Helen - I love the idea of getting together with friends to wrap gifts during this time of year. Too bad that I’ve already wrapped all my own, otherwise I would invite a couple of people to share in on the fun. 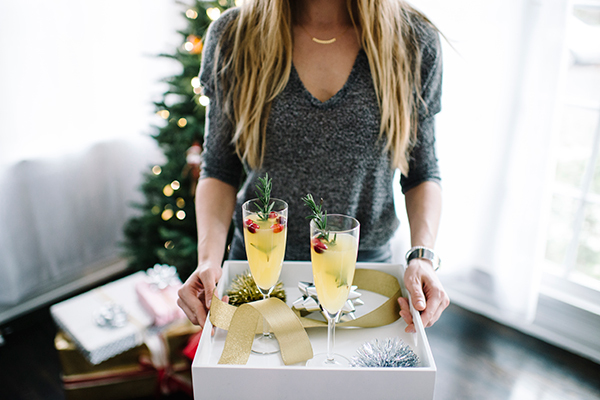 Those mimosas look delicious, by the way! Willemijn Sofie - This looks amazing, happy christmas! Andrea Fenise - This is the cutest post ever!!!! Melissa - Such gorgeous photos! Lien Nguyen - What an exciting moment! I remind me of a Christmas song sang “The Santa is coming to town”. Merry Christmas to you and your blog readers (like me) 🙂 I have a question: Which camera are you using to take these photos? The photos are beautiful and the colors are fresh and attractive. Kim Dalve - Love all these pictures-so festive! Erika - Lovely photos! Merry Christmas!! Miss Pippi - Lovely post! Your pictures are beautiful. Zmode - Wow I love it so much! Pics are amazing!! !